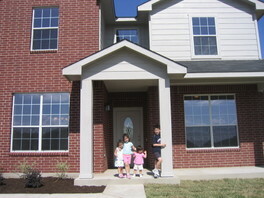 We closed on our house--two weeks late, but worth it. Now for the hard part: moving in. With all the sadness I've been immersed in, I've neglected to mention that we're closing on our house on Monday!!!! It's been a long time coming. Frankly, although my parents have been quite generous in housing us these 4 months, it's time for us to move into our own home again. At 2 pm we will start our closing and then we will be official homeowners. YAY!!! It would've been today, but we had pouring rain all day Wednesday and they couldn't lay the sod. Nor on Thursday. And, not even today. So, they will lay sod tomorrow and we will close on Monday. We had a preliminary walk through on Wednesday. The house is beautiful and close to perfect. I'm a bit daunted by the task of keeping it orderly, but with these handy dandy handy dandy notebook project ideas (click on each word for different entries by Kim and Elizabeth). I will post pictures of the empty, very clean house as soon as I am able. Which at the rate I go on the blog will be after I move in!! LOL!! Please bear with me as I grieve. I don't think I can make it to the funeral and it's sunk me pretty low. Too many forces are against me and I think God is telling me something. I feel this need to talk about this friend of mine. I tend to be very stoic so I'm pouring myself out here on this blog. I just got this link to a news article about Dave. 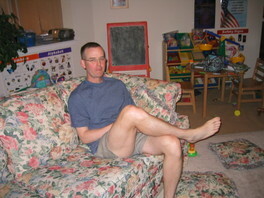 There's a wonderful picture of Dave and his family before he returned to Iraq after his R&R. I dislike reading out loud, but I do it because as Father Corapi once said, "Love is sacrifice.". I love my children and know that reading is one of the best things to do for them so I do it. Sometimes very reluctantly, but usually very enthusiastically. I'm an office supply nut. I love any office supply store, the office supply aisle at stores. Give me colored paper, pens, markers, binders, you name it and I am happy as a clam. I am a ridiculously patriotic person. I'm a naturalized citizen and there's almost nothing that rivals hearing the Star Spangled Banner. Along with number 3, I absolutely love Lee Greenwood's song "God Bless the USA". My friend, Dave, once (pre-kids) gave me a skydiving lesson for my birthday. It was absolute wonderful. I am not a confirmed Catholic. I hope to be confirmed soon, but am having trouble getting the proper documents. I know we had them once because I had First Communion. Chocolate is my favorite food. How can it not be anyone elses? I used to be the student manager for my college men's basketball team. I traveled with them everywhere. It was so much fun and I was able to visit so many states. I'm a sap. Commercials make me cry. I remember in college watching a Hallmark commercial and crying. I'm extremely shy. The above number 8 helped me to not necessarily overcome it, but to learn to work around it. When you are walking across the court with the team before games, halftime and end of the game, you sort of learn to get used to being out there. I think everyone else has been tagged. If you haven't then know I've tagged you! We met while my husband was stationed at Fort Bragg. He and my husband were assigned to the same unit and became fast friends. He had quick wit and kept me laughing all the time. He had a generous spirit. He was what I called a closet softie. He was all bark and no bite. Yesterday, he was killed in action by a roadside IED. He leaves behind a wife and 4 month old son. I am having such difficulty with this tragedy, but his wife is a true wonder. Even in the midst of her sorrow, she knows that he died doing what he believed in. He thought we needed to be there and that we were doing a good thing. She also knows she will meet him again. Please pray for my friend, Major David G. Taylor. I loved him like he was my own brother. I miss him terribly. Get ready to laugh and cry reading this Loveliness Fair hosted by Elizabeth. Get a cup of something warm (it's cold even here in Texas) and a box of tissues. 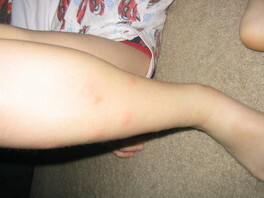 We went out to eat with my family last night and a mosquito or two entered the car with us. 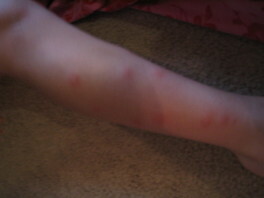 These awful bugs went to town on Brother. He didn't realize he had been bitten until they started to itch. 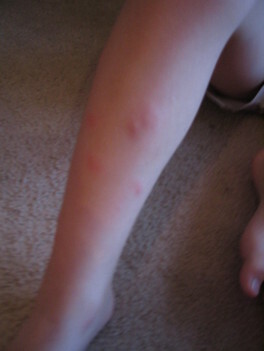 By then, the mosquito(s) had dined quite well on Brother. One of my favorite bloggers, Dawn, has a great post about her homekeeping notebook. It's perfect timing as I'm working on putting mine together.